We have moved to an urban city, across the state from where we lived in a sweet, rural, old (vintage) Victorian farm style house, built in 1892 with different kinds of additions added onto the basic house. It was the cupola that set it off as Victorian styling, while the interior was more along the lines of an old farmhouse. There was the mix of lots of space, allowing me to collect and add vintage items that fit in almost anywhere I decided to put them. As well it was a beach house, so ocean, nautical decor worked easily into the farmhouse vintage victorian styled decor. Now that we’re in our urban condo though, the vintage collectibles don’t work as well. It caught my interest how she is using an old wooden breadbox. I have a breadbox … in a box … in the garage … pink, mid-century or somewhat earlier that went with my ‘pink’ phase which included chrome and brass pink formica table, pink mid-century cake taker, pink mixmaster as kitchen decor because it only sort of worked, and some other pink collectibles and kitsch that I will not be able to use in our new place. The idea of using some of the vintage in the craft room I am trying to put together, and the way she suggests using the breadbox will work for me beautifully! Although it is not a box, per se, as much as a bread keeper, and I can use it in the manner of the two shelves keeping craft items secured. 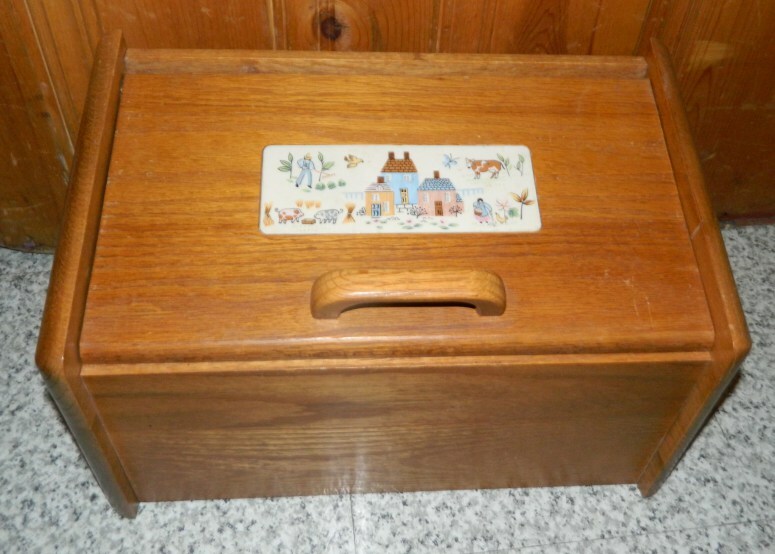 I have an adorable wooden bread box that I scored at a garage sale a few years ago for a quarter. I’ve mentioned previously, that we are a gluten-free, corn-free family. Well, we are also yeast-free and xanthan gum-free too. I gave up a long time ago finding/creating a recipe for bread without those ingredients! but it has been repurposed into a ribbon box! 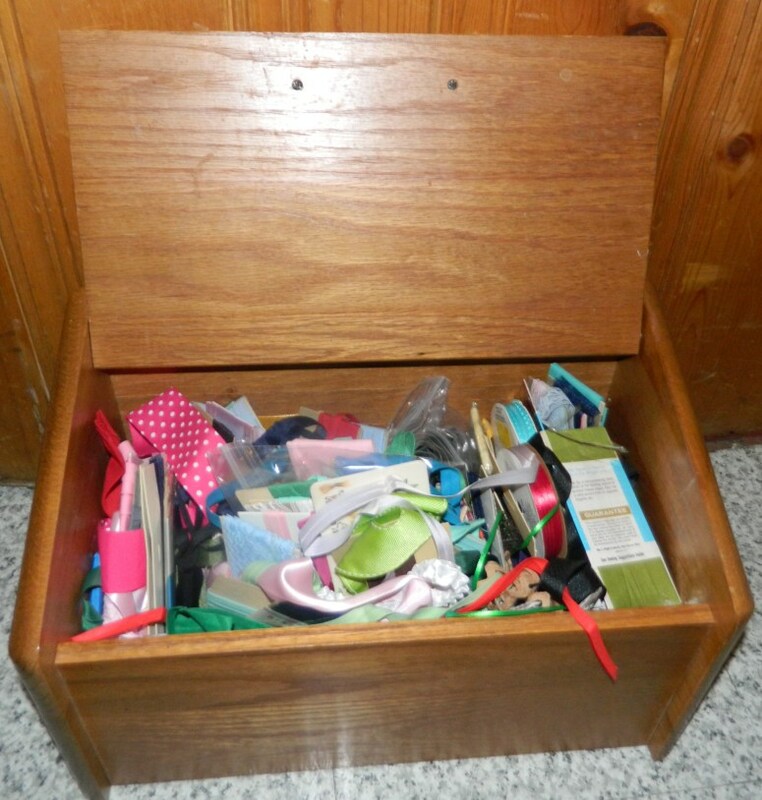 I store my ribbon spools, bias tape, and various strings in this vintage bread box! If you have a bread box that needs a new purpose in life, it could be used to house an assortment of things! I love boxes and tins. I keep all kinds of things in them. This entry was posted on February 21, 2015 by Lietta in repurpose, vintage and tagged repurpose, vintage.